I’m honoured that it’s listed one of their “Best of PASS Summit 2017” sessions, and there are lots of other great videos on the same page including Alberto Ferrari’s session on DAX optimisation. Some of the tips in this video include a few things I’ve been meaning to blog about for a while, including how important it is to set the ValueColumn property on your dimension attributes in SSAS MD – it lets you use lots of functionality in Power BI that isn’t otherwise available, including date slicers. …and which are documented in the Sql.Databases() M function here. 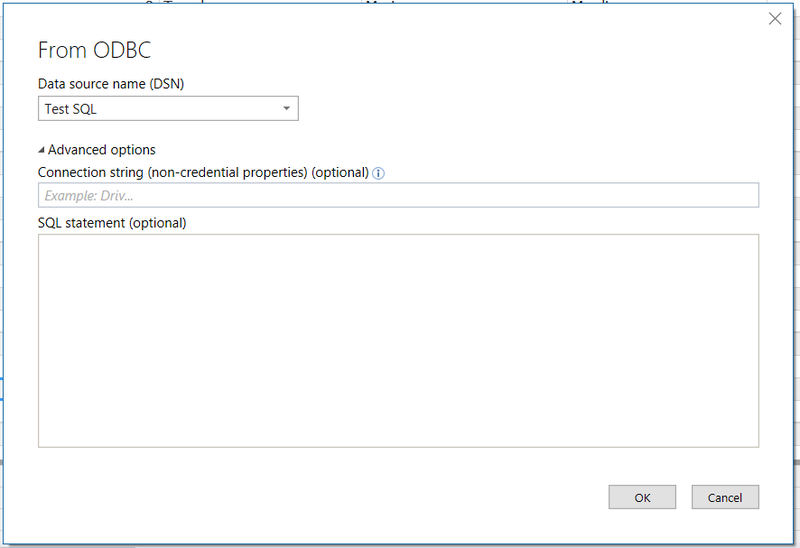 It turns out that the restriction on using your own connection string properties in the built-in SQL Server connector is a deliberate design decision on the part of the Power Query team because, behind the scenes, they use different providers in different circumstances to optimise performance, and because allowing arbitrary connection string properties might make maintaining backwards compatibility difficult in the future. 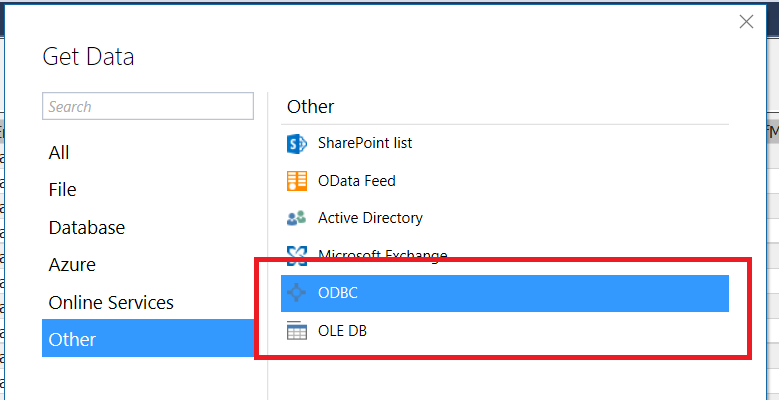 The documentation for the Odbc.DataSource and OleDb.DataSource M functions has more detail on how these connectors can be used and how connection string properties can be set. Remember also that the OLE DB Provider for SQL Server was un-deprecated in October 2017. 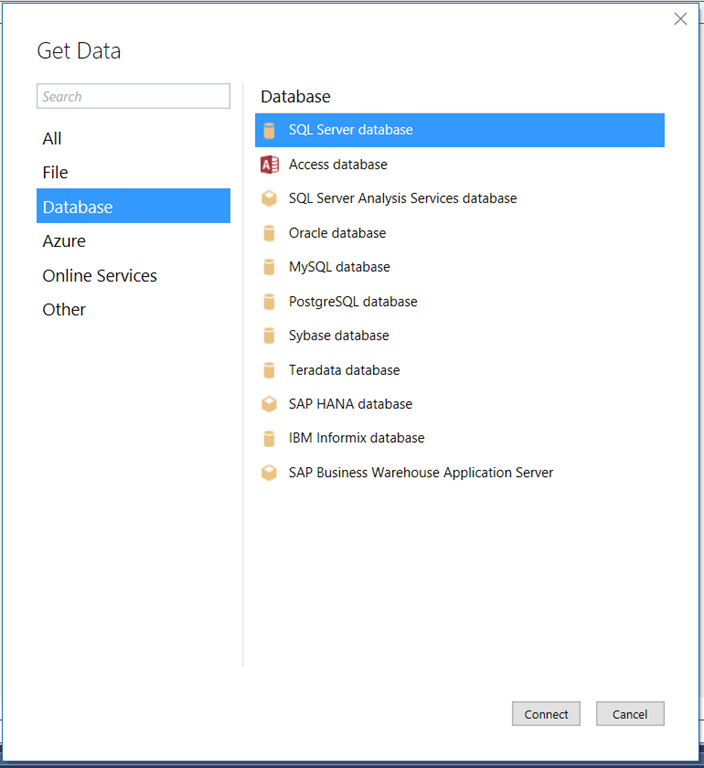 However, apart from possible performance differences between the two (which you should test yourself – Henk van der Valk wrote a good post on this for SSAS MD and most of what he said is relevant for Tabular) there’s one less-than-obvious difference between these two options: the OLE DB connector does not appear to support query folding right now whereas the ODBC connector does. Of course this isn’t an issue if you’re writing your own SQL queries to import data, but if you do want to use M functions for partitioning (as I show here) you’re likely to get very poor performance with the OLE DB connector. While the integration of the Power Query engine into Analysis Services Tabular 2017 and Azure Analysis Services with modern data sources will certainly bring a lot of benefits, I think it’s fair to say that the implementation has not been entirely painless. 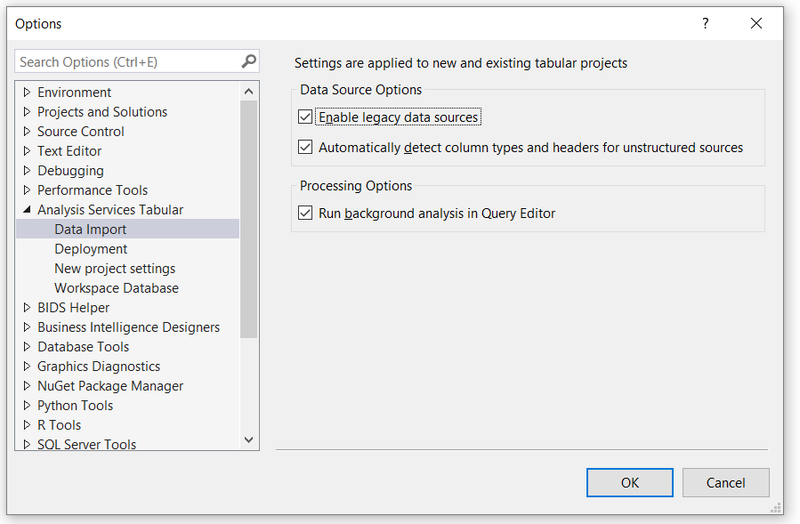 One problem is that it is no longer obvious how to specify your own SQL query to populate a table or partition in your Tabular model – and while the Query Editor is great, there are a lot of cases where this is necessary. In this post I’ll show you how to do this. This is deliberate. 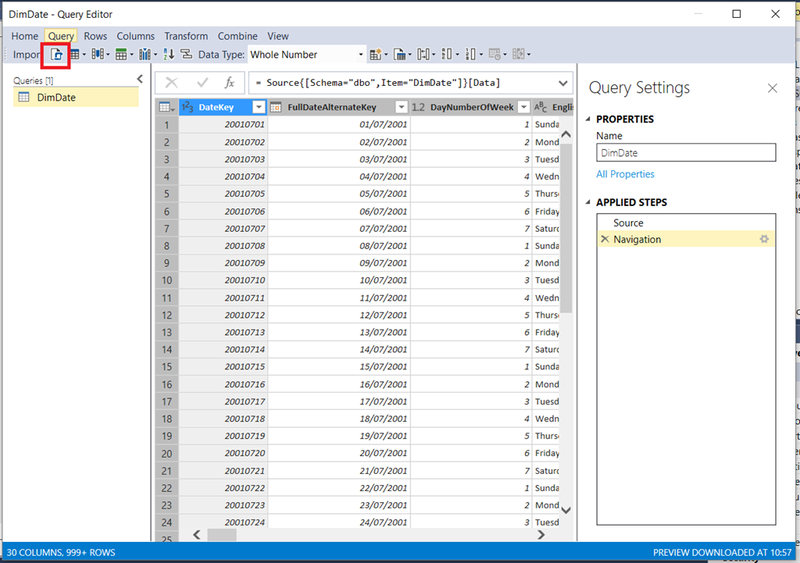 In Analysis Services, unlike Power BI and Excel, there is a distinction made between data sources and other M queries that return data from those data sources, one that makes a lot of sense in my opinion. While it is possible to enter your own SQL for other data source types, such as OLE DB connections, a data source object is really intended just to define a connection to a data source and not to define what data you want from that data source. To import a table or view in your database all you have to do is right-click on your data source and choose Import New Tables; my blog post from September last year describes how to do this, and how to use M functions for creating partitions. In this example the Source step creates a reference to the data source you have already created, and the dbo_DimDate step gets the contents of the DimDate table from this data source. "SELECT DISTINCT FiscalYear FROM DimDate"
Here what I’ve done is replaced the dbo_DimDate step in the previous query with a step called MyQuery that uses Value.NativeQuery() to run my own SQL. 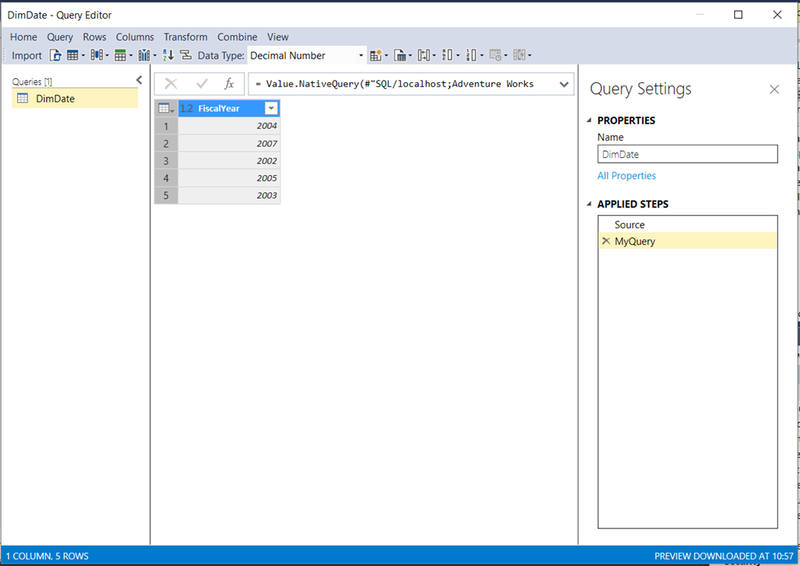 Now all you need to do is click Import and you have the output of the query loaded into SSAS. It would be nice if there was UI support for using your own SQL queries when importing data in the future. Note that, as soon as you use this method, any other steps or queries further downstream will not be able to perform query folding, so you should make sure that you do as much of your filtering and transformation in the SQL as possible otherwise you may encounter performance problems. The documentation describes a similar – but not identical – workflow for achieving the same result here. Personally I think it’s counter-intuitive that you should click on Expressions to create a Table object! Expressions are used for functions and other M code that is shared by the M queries used by Tables. 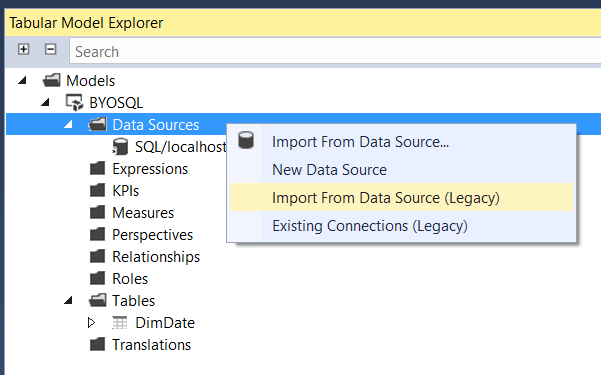 When you do this, you’ll notice two new options when you right-click on Data Sources in the Tabular Model Explorer pane: Import From Data Source (Legacy) and Existing Connections (Legacy). 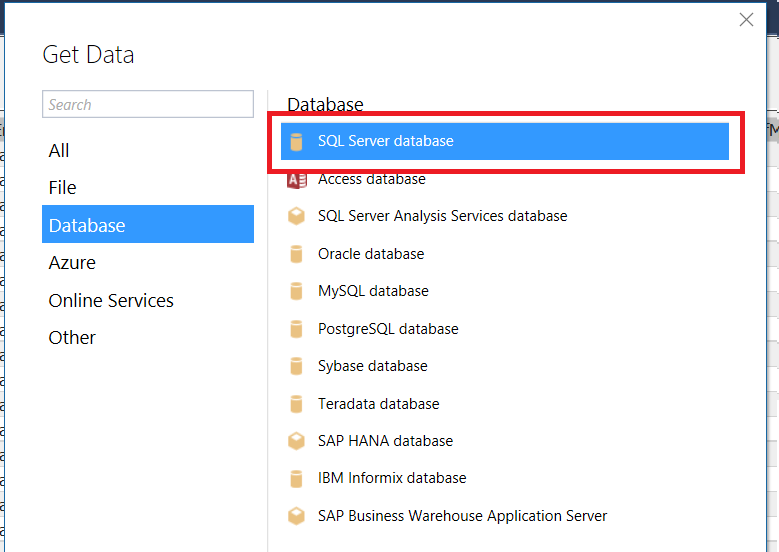 This gives you access to the Table Import wizard that was available in previous versions of Analysis Services Tabular, which not only allows you to enter your own SQL but also creates a legacy data source that in turn makes it easy to use your own SQL when creating partitions. 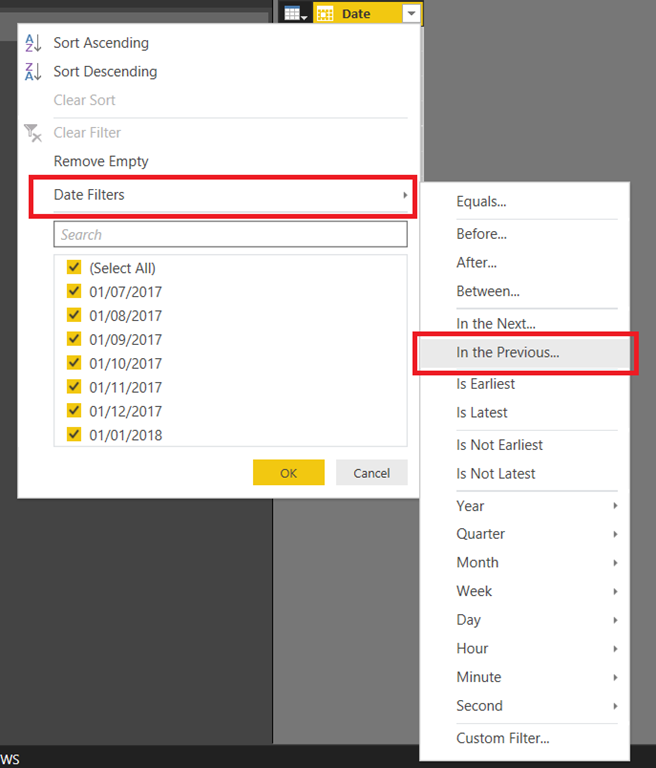 The Query Editor in Power BI/Excel Get&Transform/Power Query has a number of built-in ways to filter data in date columns relative to the current date, such as the “In the Previous” option. However these filters behave in a way I find non-intuitive (and I’m not alone) and it’s not obvious how to get the behaviour I think most people would expect. 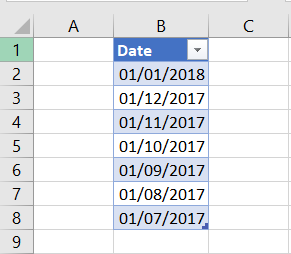 In this post I’ll show you what the built-in relative date filters actually do and how you can get change them to do something more useful. Six out of the seven dates in the original table are returned, but not the six I would expect. 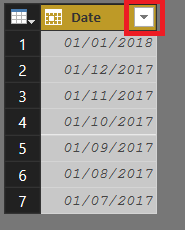 Remember that today’s date is January 8th 2018, and notice that January 1st 2018 is not present in the filtered table and July 1st 2017 is present! 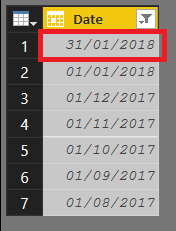 I don’t know about you, but I would say that January 1st 2018 should be considered as being “in the previous 6 months” and July 1st 2017 should not be. 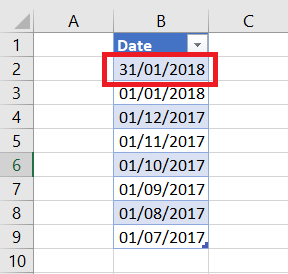 The reason this is happening is that the M code generated by the UI uses the Date.IsInPreviousNMonths function, so as a result the filter is getting all the dates that are present in the six months before the month that today’s date is in. Hmmmmm. 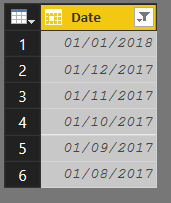 In this query, the EndDate step returns today’s date using DateTime.FixedLocalNow(), the StartDate step returns the day after the date that is six months before today’s date, and the FilteredRows step filters the dates so that only those that occur between StartDate and EndDate are returned. 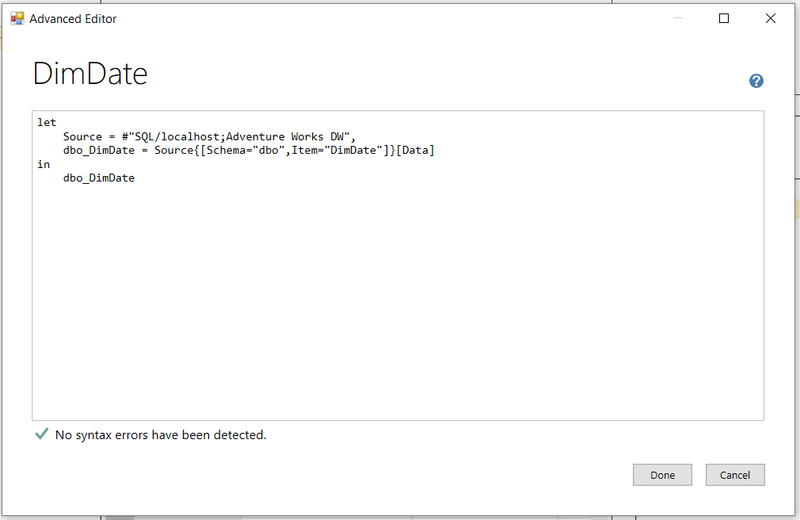 And yes, I checked, if you do this with a SQL Server data source then query folding does occur. To be honest, though, I don’t think it should be this hard!